Both taste explosions in one box. Snack as much as you want. We've cracked the code! Crispy coconut flakes and velvety caramel, drenched in melt-in-your-mouth whole milk chocolate. Totally free of all added sugars. Just as tasty as your favourite chocolate bar, but 90% less sugar and only half the carbs. Fewer empty calories for you. More protein for your muscles. All information is per portion (65 g). A real taste explosion, instead of a sugar bomb. Total taste Explosion. Without the sugar bomb. We toiled and tried and tested, and just when we were about to give up, we found the perfect recipe: low-calorie, sweetened cocoa, coconut flakes, caramel, and protein crispies for that extra crunch. And no added sugar. And only a fraction of the calories. ** It's practically perfect. Your favourite chocolate bar, just healthier? Done. Four layers. One feast of flavour. *Varies by type, but always at least 90% less sugar when compared to commercial chocolate bars. **Compared with conventional chocolate bars. ***Raw ingredients contain naturally occurring sugars. No added sugar. It is important to maintain a varied and balanced diet and a healthy lifestyle. May contain traces of gluten, egg protein and soy. When can I snack on an Extra Chocolate Protein Bar? It’s simple: Whenever you're in the mood for a delicious chocolate bar. After your workout, as a midnight snack, in the office, or when you're watching your favourite show on Netflix. All three kinds of Extra Chocolate Protein Bar are sheer chocolatey bliss. 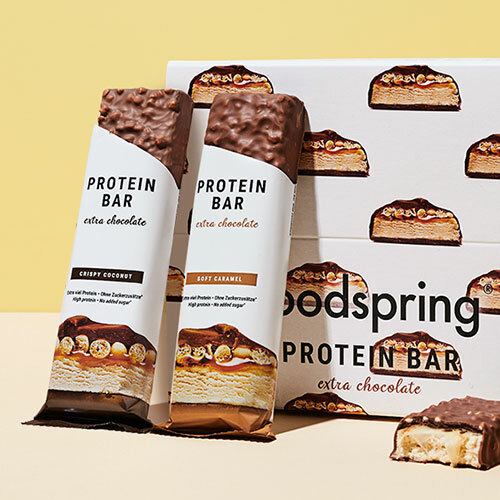 How can a protein bar without added sugar be so decadently delicious? Our protein bars contain only the natural sweetness of the finest raw ingredients and steviol glycoside, commonly known as stevia, plus maltitol. The sweetener is 75–80% as sweet as sugar but has only a fraction of the calories. Are Extra Chocolate Protein Bars low in carbs? Our Extra Chocolate Protein Bars contain up to 90% less sugar than most conventional chocolate bars, and 50% fewer carbohydrates. We also don't use any added sugar. You will find maltitol listed as a carbohydrate in the nutritional values because we're legally required to label it that way, but your metabolism treats it differently than table sugar. How many Extra Chocolate Protein Bars can I eat if I want to lose weight? To lose weight, you need to burn more calories per day than you consume. Our Extra Chocolate Protein Bars contain up to 30% fewer calories than most conventional chocolate bars and are made up of more beneficial nutrients: fewer calories from sugar, more calories from protein, valuable unsaturated fatty acids, and real ingredients like peanuts, cocoa, and coconuts. At only 220 kcal per bar on average, it's simply the perfect snack. Protein Bar Extra Chocolate 12 Pack Duo will be back in stock shortly.